Today I got up at 7:45 am and walked the short distance to the main lake to take some photographs. It is very foggy and the lake looks surreal with a mist hanging over it. The mountains are mostly hidden in the fog. It is fairly cool at 9.4ºC. Kelly gets up at 8:30 am (she likes her sleep) and we have a leisurely breakfast before leaving at 9:45 am. It is only 79 kilometres back to Mt Field National Park so we do not have much travel time today. We stop at 10:15 am at Creepy Crawly Nature Trail which is a couple of kilometres before the main road to Strathgordon. We had missed this on the way in as the sign is hidden. We do this walk which is aimed at kids it would appear. Nice rainforest but a "silly interpretative story" as Kelly wrote in our diary. From here we headed east on the main road and we stopped at the protesters' camp. We went for a walk along a new road that forestry pushed into the forest. The trees are huge, even only a few metres off the main road, and our feelings are that this should not be logged. We walk through the camp with one of the blokes. 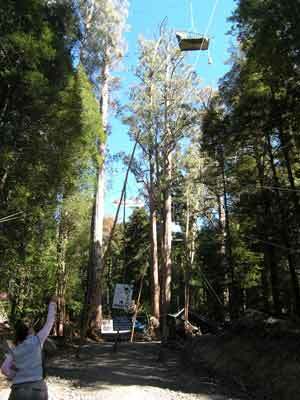 There are numerous camp sites up in the trees and there are people living there 100% of the time. Apparently this section, the Florentine Valley, used to be part of the Southwest National Park till it was excised about 18 months ago so it could be logged. 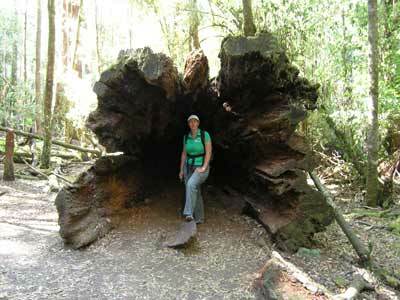 It is hard to see why such beautiful specimens need to be cut down. We continue on and at Maydena, we turn left and go to Junee Cave which Kelly has noticed on a map we are using. Apart from a sign on the main road, we see no more signs. We come to a very small parking area which is the right distance so we stop. We have no idea what to expect so we walk down the track. The track comes to a stream and then follows it. The stream is crystal clear, unlike all the streams in Tasmania which are tea coloured. It is a very pretty walk, with lots of ferns. The track comes to an end. Here the stream exits from a cave. This is Junee Cave. There is a sign here which explains about the cave and some of the other ones in this area. Apparently the deepest cave in Australia is here. A nice walk, which would have been better if the signage was at the car park so that we knew what to expect. From here we head back to the main road and get some petrol from the small shop on this corner. I am a bit short and need some to enable us to get to New Norfolk tomorrow where the fuel is a lot cheaper. I get 20.4 litres at $1.47. We head east again. At 12:15 pm we come to National Park. We go to the National Park Hotel and enquire about lunch. Unfortunately, on Sundays they only have a baked dinner and since we had that last night, we are not too keen on having it again. We have a beer and look at the photos in the bar. We speak to the publican and find that he worked on the Gordon Dam. He has not been there since it was finished in 1972, even though it is less than an hour's drive away!! A nice pub. 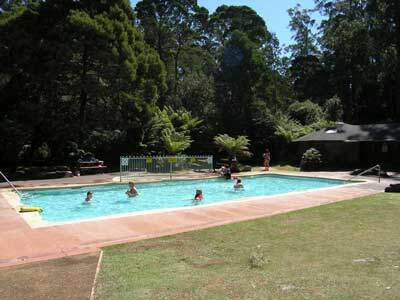 We leave at 12:40 pm and take the turnoff to Mt Field National Park. 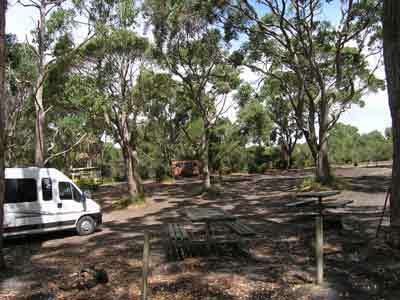 Just off the main road is the entrance to the national park and just inside there is a nice camping area called The Giants Camping Area. Five minutes after leaving the pub, we book into the camping area. The cost is $8 per person per night for an unpowered site. We do not actually set up camp yet but have a look at the range of sites. We mentally pick out our site. We drive up to Lake Dobson. This is the location of a skiing area (downhill using old rope tows and cross-country). It is 15 kilometres up a very narrow and winding road. Unless you are going for a walk, there is not a lot to see as the road does not go to the ski area itself. There are some buildings you can see on the hills. The lake is quite nice, but it was a bit of a wasted trip. We make some lunch and eat it by the lake. At 2:00 pm we leave and go back to the camping area. We get the site we have previously selected, a nice one right up the end and close to the amenities block. This is an old building but there are nice hot showers, washing machines and dryers. We set up the car and head off to do a couple of walks. We go to the visitors' centre and get a brochure on the walks. We set off at 2:45 pm and before we even get to the start of the first walk, we find an echidna digging in the grass. A crowd soon gathers and the echidna just goes on digging. 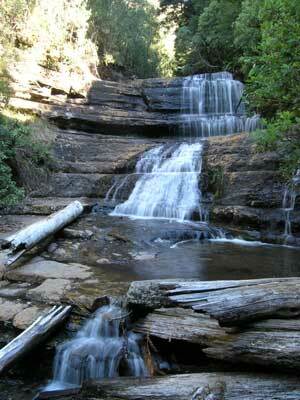 We walk to Russell Falls and then Horseshow Falls. The first one is very easy and the second one suitable for most people. We then head across to Tall Trees and then onto Lady Barron Falls. Again, this one is very easy and quite interesting. 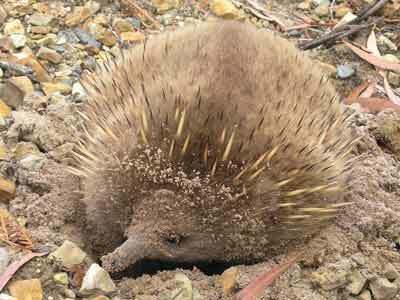 We find another echidna, but this one is a bit shyer. 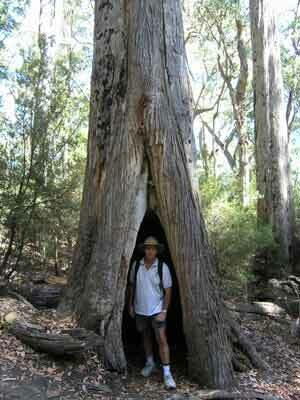 The waterfalls are all nice and there are lots of tree ferns, large swamp gums and more. The last section back from Lady Barron Falls has a new section of timber stairs that seems to be a bit stupid (and must have cost a bomb to build). There are 249 stairs (Kelly counted them) and you climb back up only to have to go all the way back down again on the track as you approach the camping area. It looks like the old track ran parallel to the river and ended up near the camping area. It would be much better to have this walk in the opposite direction. We arrive back at the camping area at 5:10 pm, taking almost 2.5 hours to do the walks. We crack open a couple of beers and relax a bit before having a shower to wash off the sweat. It has been a relatively warm day, sunny with a maximum temperature of about 25ºC. 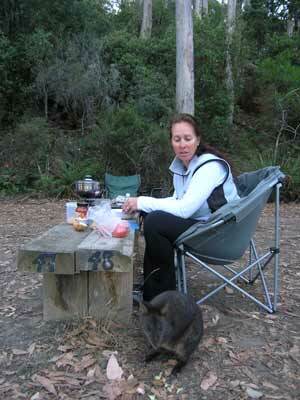 We have meatballs and pasta for dinner, with lots of pademelons and possums around. During the night I am awoken by a noise. Turns out that a possum has climbed the ladder and is half way up to our tent. I shoo it away. The night is much warmer than previous nights. Today we have a lot of travel and we also need to restock with food, drinks and fuel. Accordingly, we are up relatively early but we still are slow to get away. We are heading towards Hobart. It is a good road all the way to Hobart and like all Tasmanian roads, there is very little traffic compared to back home in Sydney (we were amused on our trip to Hobart in 2005 to hear a traffic report in the afternoon peak - there was NO traffic - less than a weekend in Sydney). We travel via a town called Bushy Park that had lots of hop farms and old barns that resemble American barns. We look for a supermarket and find the Woolworths at New Norfolk. We get here at 9:50 am and purchase more food and drinks and we manage to get a new saucepan. We also have to purchase a new camp toaster as the flyscreen on ours has fallen apart and the fire burns the toast. We find a saucepan in Woolies and a toaster in the local Mitre 10 hardware store. I then refuel the car ($175.27) and we have some morning tea in a nice park (Arthur Square) opposite the service station. There are toilets and tables here. At 11:25 am we are back on the road heading for Hobart. The road follows the River Derwent and at noon we pass through Hobart. We continue south and pass the hotel that we had a few drinks at on our previous trip. 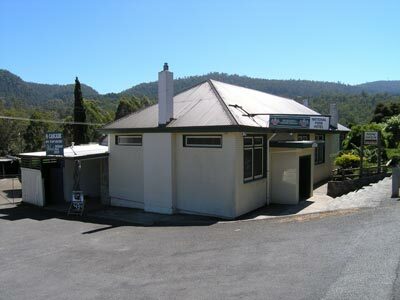 This old pub overlooks the Huon River near Franklin. We had such a good time there we wished that we could have stayed the night but we had accommodation booked and paid for in Hobart. We had planned to stop at the pub but it was closed till 4 pm! We continue on to Dover (1:30 pm) and purchase some rolls at a bakery. We go to the waterfront and eat lunch in a park under a shelter shed (opposite the caravan park). We leave at 1:58 pm and head to Southport. This small town claims to be Australia's southern-most settlement. However, I have become disbelieving of such claims without checking further as too many times I have seen claims like "Australia's Highest Waterfall" when it is not. I do actually believe that Southport's claim is correct. 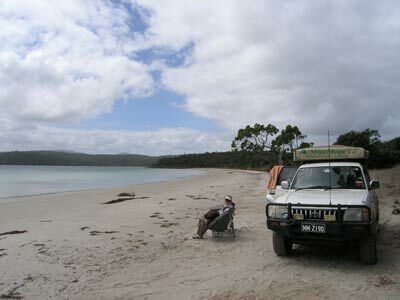 In 2005 we stayed at the Alonnah Hotel on nearby Bruny Island. This hotel claims to the Australia's southern-most hotel, something I did not believe after I looked at a map of Tasmania. This is one of my reasons for coming to Southport as I want to check if it has a hotel. Sure enough, here is the Southport Settlement Tavern. Looks like a pub to me and it sells beer. However, the pub is shut! The associated general store is open so I cannot understand why the pub is not open. There is no sign saying when it might open. It is a very warm day (29ºC) so a beer would have been nice. 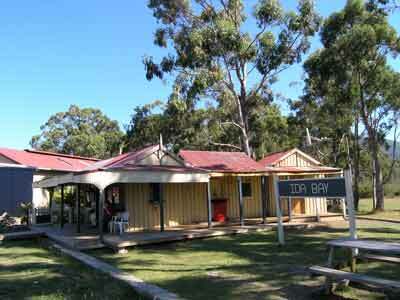 Perhaps the Bruny Island pub should say "The Southernmost Hotel that is Open All Day"! We head out towards Hastings. This has some hot springs and caves. We arrive at 2:40 pm and we drop in and spend a relaxing hour swimming in the 28-30ºC water. It costs $5 per person. There are really nice grounds, picnic tables, shelter sheds, barbecues and toilets etc. There was a small walk that goes via the source of the water. We leave here at 4:00 pm and head south again. 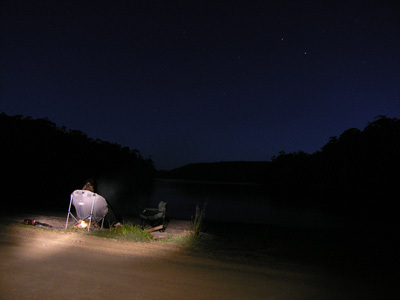 From here it is a short run to the southern-most camping area in Australia, Cockle Creek. 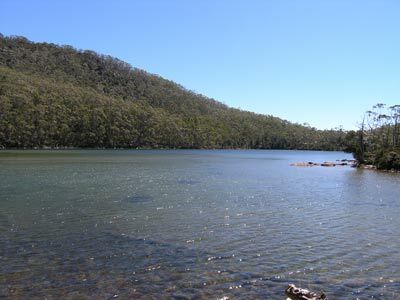 This is in Southwest National Park. 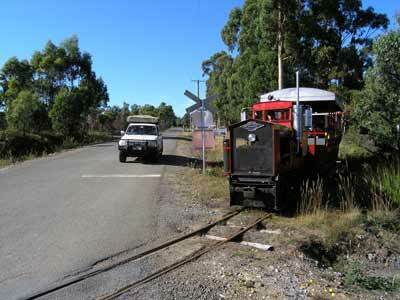 First we go through Ida Bay where there is a small historic narrow gauge railway. This used to run between a mine here and the wharf on the coast. Now they do trips a number of times a day pulling small carriages. We only stop for a few minutes as the train is in its shed and we might see it tomorrow. We continue south and the road turns to dirt. At first it is state forest but then conservation area (I think) and eventually it becomes national park. There are a number small communities like Moss Glen and Catamaran with some huts/cabins. These are on the water and it is a beautiful location. We come to the camping areas and to say that it is overcrowded would be an understatement. We drive right to the end and we are feeling a bit depressed. I had thought that this would be a spot that had few visitors, I was totally wrong. 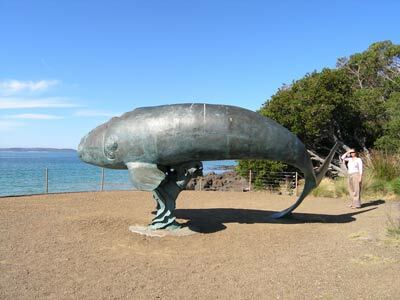 We drive right to the end into the national park (where you have to pay fees I think) and stop and look at the whale sculpture. This is nice and the bay is quite beautiful. We do not fancy camping here. Kelly has noticed a spot as we came in so we decide to head back there. As we go, we look at the camping spots again trying to find one that might be okay. We run into the couple we met at Arthur River and see some others that we have been seeing since the start of the trip. It looks like everyone in Tasmania is here. Back on a small bay exactly opposite the whale sculpture we find the spot that Kelly saw. 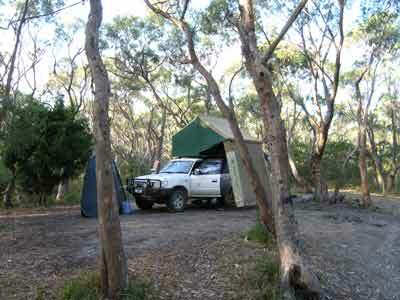 This has a space large enough for two cars like us (or two tents so long as you parked opposite). 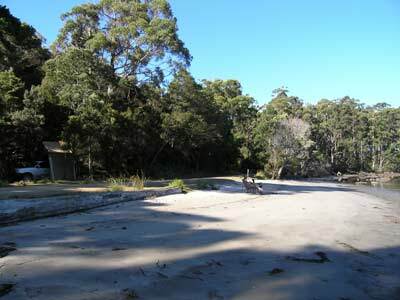 This is on the western side of the road, a hundred metres north of the D'Entrecasteaux Historic Site Day Use Area and about 800 metres south of the Catamaran sign. Right next to the road is the beach. We set up camp at 5:10 pm. We put our chairs on the beach and have a few beers looking out over the bay. Magnificent! The sand is white and the water very clear except right on the water's edge. I light a fire on the beach and once we have some hot coals, we cook a barbecue. We had a late night, sitting up with a few drinks looking out over the bay. Before going to bed, we hear on the car radio that there is a total fire ban for most of Tasmania tomorrow, with temperatures expected in the mid-30s. In a straight line, we do not have that far to go today, only 32 kilometres. However, by road it is a different thing, about 200 kilometres or so. We leave at 9:07 am and it is already warm, 15ºC. We stop at Ida Bay Station again and the train is just leaving. I run ahead and take some photographs of it as it crosses the road on its run to the water. From here we head back to Dover and instead of following the main road, we go via the coast. This is a very picturesque route, passing through Roaring Bay and Police Point. We stop at Franklin to top up with water. On the way through we had noticed that there is a camping area opposite the old pub we had wanted to have a beer in yesterday. This has a public watering spot so I fill up all our water containers which were almost empty. After morning tea, we back track to Huonville and then take the road down the other side of the Huon River to Cygnet. We arrive here at about 11:15 am. 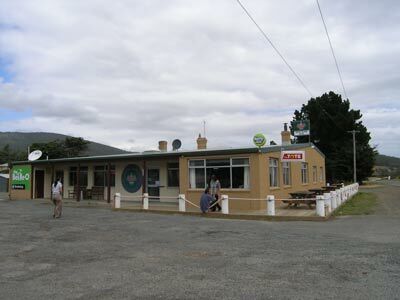 On our 2005 trip we stopped at Cygnet and purchased our lunch from a pie shop on the main road. Kelly had a chicken and camembert cheese pie which was one of the best pies I have ever tasted. Since then she has been dieing to have another pie. Accordingly, our late start has enabled us to get to Cygnet at lunch time. We both purchase a chicken and camembert pie. Magnificent! As good as I remember it was (and I only had a small taste before). We head off across the hills to Kettering, taking a different road to the one we did back then. 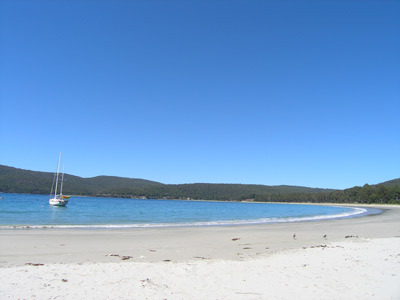 Kettering is a small town on the D'Entrecasteaux Channel which is the terminal for the ferry across to Bruny Island. The ferry costs $25 for the return trip and it leaves Kettering roughly every hour and a half (it is the worst set up timetable I have ever seen - no way could you remember it). We catch the 12:05 pm ferry. 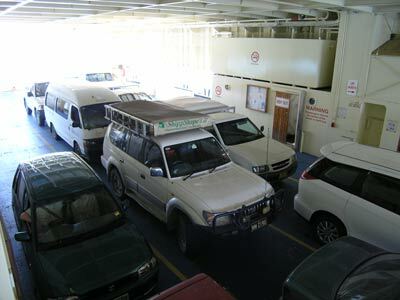 It is only a short trip across and by 12:23 pm we are off the ferry and heading across the island. Bruny Island is sort of shaped like an 8, with the middle bit being a long thin sand isthmus joining what is really two separate islands. We head south on the main road and are soon at the isthmus. On the northern side is the penguin rookery. We stopped here last time to look at the penguins come ashore. However, we did not have any torches and did not seen any except one when we were walking back to the car. We did hear many. This time we are better prepared and will come back tonight or tomorrow to try our luck. 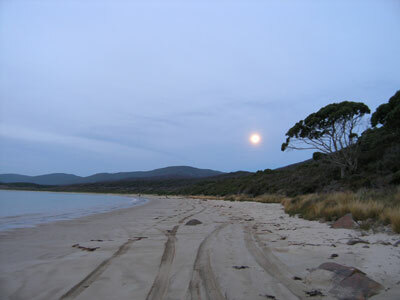 The southern section of Bruny Island is where most of the small population lives (and where the people who have weekenders live). We go to the Neck Camping Area (12:50 pm) which is at the southern end of the isthmus. We decide that this is a nice spot so we will probably return and stay here tomorrow night. 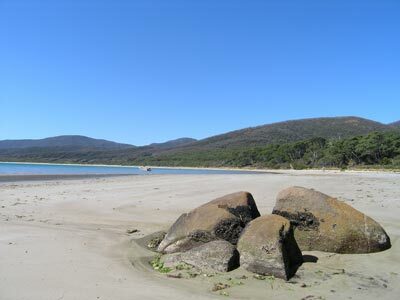 The eastern side of Bruny Island has a small township called Adventure Bay. This is on the bay of the same name. 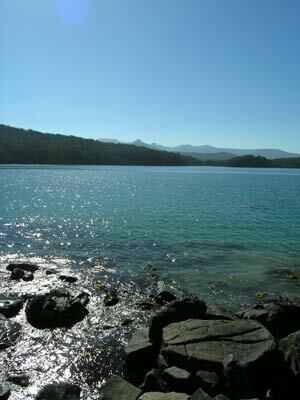 This bay has quite a famous history, being where many famous explorers have anchored. Even Captain William Bligh and Captain James Cook stopped here. There is also a small museum to Bligh and we looked at this last time. An okay place to spend an hour. There is a caravan park here and right at the end of the road there is another one that is not as obvious. We will later speak to people who stayed here and they said it was very good. Adventure Bay has lovely white sand and blue water, it looks like a tropical island. It is now really warm 28ºC. There is also a small general store here that sells takeaway food as well. We decided to head to the southern part of the island via one of the inland roads. We turn at the southern end of the caravan park (Lockleys Road) and travel right across the middle of the island. It is an easy trip and you could do in a two wheel drive. 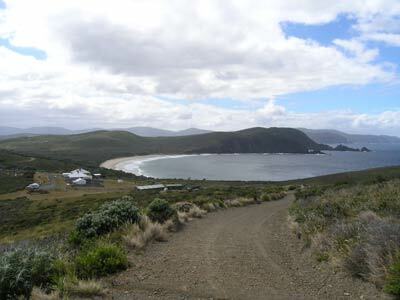 The road comes out onto the access road to Cloudy Bay about one kilometre from the bay itself. We drive to the bay and it looks fantastic. The water is crystal clear and blue and the seas absolutely flat. We drive down onto the beach and then along the beach itself. The tide is down a fair bit and the sand is quite hard. 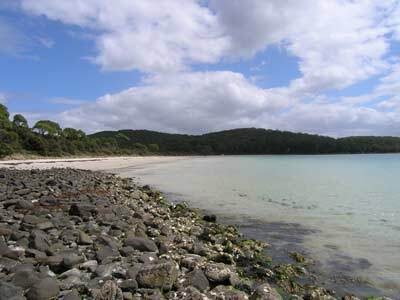 It is about 3.25 kilometres along the beach to the access track off. 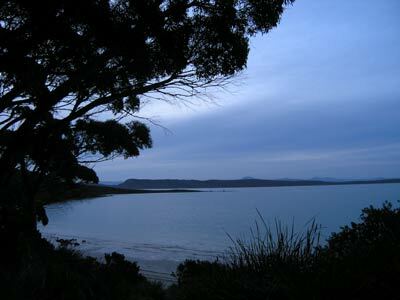 The reason we are going down the beach is to get to the Cloudy Bay Camping Area. The only access is via the beach. This is located at the south-eastern end of the beach, up on the top of the sand dune. It is very nice and there are only a few cars here when we arrive at 2:30 pm. We pick our spot and park the car. By now it is very hot, 34ºC. We take our towels and go down to the beach. We have a swim to cool down and the water is not too bad, probably about 18 to 19ºC. Once you are in it is quite nice. We spend the rest of the afternoon sunbaking, reading and swimming. Very relaxing! Late in the afternoon, I see a car approach along the beach. There are sprays of water coming up. I grab the binoculars and see that the car is driving through the water's edge like you see in four wheel drive advertisements on TV. It comes right past us and is a brand new lime green Ford Falcon XR6. It is being driven by a 20 something male with his bimbo girlfriend as a passenger. Obviously Dad's or a work car, no-one in their right mind would do what he has just done. After 15 minutes he heads back, continuing to drive through the water, sending huge sprays of saltwater all over the car as the westerly wind blows it back. Towards the end of the beach a huge spray comes up and he slows right down. Either he has scared himself or the car is running roughly. I would not want to purchase this car when it is sold, it will be a rust bucket. Some more about the camping area. You can only access at a lower tide as in spots the water comes right up to the bush's edge. 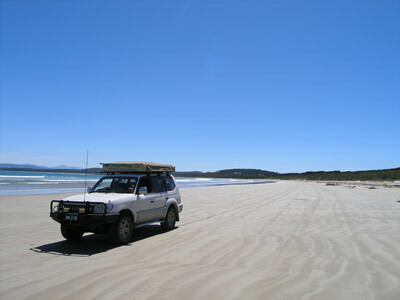 At low tides, even two wheel drives can access as the sand is very hard. In fact, half of the vehicles out here are two wheel drives. Even a camper trailer would be okay. 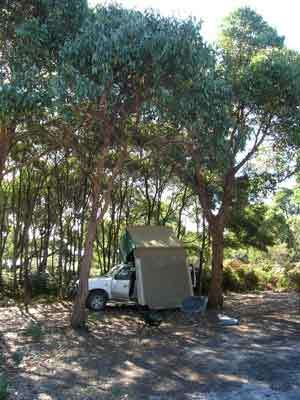 The camping area has a couple of toilets and is shaded by lots of trees. It is still 28ºC at 7:15 pm. We cook Mongolian chicken and rice for dinner. We go to bed at 9:30 pm and read till 10:00 pm. It is very warm in bed and we need only a sheet to keep us warm. At 11:30 pm a southerly change hits and there are a few spits of rain. It cooled a bit and by midnight it was calm again. At 3:30 am the wind blew up and it was almost gale force. There was a lot of rain which continued till about 6:00 am. This morning we stay in bed till 9:30 am as it is cold and we cannot leave the camping area until the tide has dropped enough to let us drive on the beach. The air temperature is 15ºC but it is blowing at least 20 knots and very cloudy. We have breakfast and then read till 11:15 am when we leave. The beach is a bit different to yesterday, with lots of breaking waves. It is now drizzling a bit and we get to the Bruny Island Lighthouse at noon. 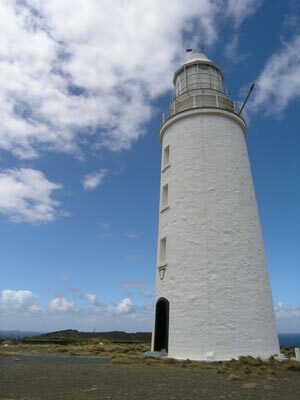 We did a tour of the lighthouse when we were last here but this time we just walk up and take some photographs. We leave at 12:30 pm and drive to nearby Jetty Beach arriving 10 minutes later. Here there is a nice camping area with toilets and tables. We drive onto the beach at the boat lunching spot and have lunch. It is very protected here from the strong southerly wind as the beach faces north. We sit and read our books. It is quite nice, as the sun comes out about half the time. 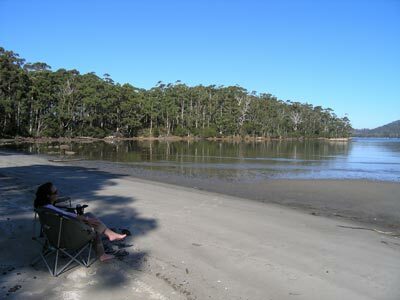 Later, some people tell us that there are lots of oysters at the end of the beach so we head off for a walk. Kelly loves oysters so we take a screwdriver and hammer and I collect about 8 huge ones for her to eat. We return to the car and read some more. We leave at 2:15 pm and drive to Alonnah. This has the island's only pub. We stayed here last time in the very quaint accommodation. It also had a very good restaurant where we had a nice meal. Since then the ownership has changed (we saw it on The Real Sea Change on Channel 7 hosted by our friend John Howard - our emcee at our wedding). We stop off and have a beer. We are a bit disappointed to find that the new owner has removed a lot of the "junk" from the restaurant and bar area that gave it a lot of its character. All the fishing nets and floats are gone. Anyway, we have a couple of beers before leaving. We drive to Simpsons Bay to have a look but there is not much to see. We continue on to the Neck Camping Area and we arrive there at 4:00 pm. We see another echidna on the side of the road just before we get there. We find a nice spot on the northern side of the camping area and we set up camp. I start a fire straight away as we are having a roast dinner. 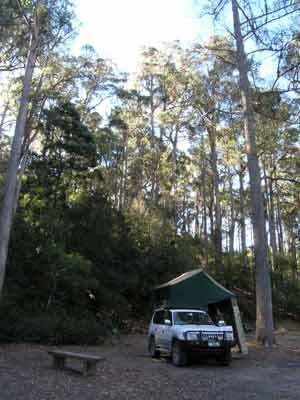 Here we again see a campervan that we first saw in the state forest at Strahan. We chat to the woman (from Queensland) for a while. Could she talk! After we each have a hot shower, we cook the roast dinner. It was great as usual. After dinner, we walk along the beach to the penguin viewing site. It is about three kilometres and it took us 40 minutes. It was a very nice walk. At the viewing spot we find lots of people. There is also a national parks ranger who gives us a very informative talk. It turns out that there will not be many penguins (little or fairy penguins) coming ashore as it is moulting season and they cannot enter the water while they are losing and growing feathers. Soon after dark, thousands of short-tailed shearwaters (muttonbirds) come in and circle around before landing. 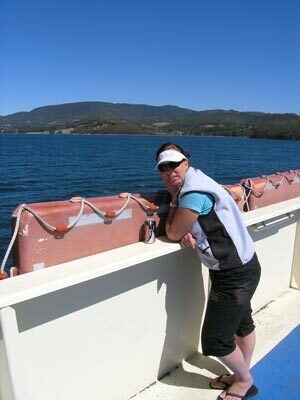 A few penguins come ashore and I see one (Kelly doesn't as she is up the track looking for penguins). There are heaps of penguins to see on the sand dunes behind the beach and we count at least 12 or so. We walk back to the camping area along the road (the wind is up a little and it is cool on the beach). It again takes us 40 minutes. We are in bed at 10:30 pm and we read for a while. There are some possums around the camping area.